​In November, California voters voted seventeen different ballot measures, ranging from bilingual education to the death penalty. ​To help them out, we created a series of podcasts that explained California's ballot measures by telling the stories of the people affected by them. ​You can listen to all of the podcasts here. How do students​ decide what to focus the podcasts on? What are students learning from making these podcasts? 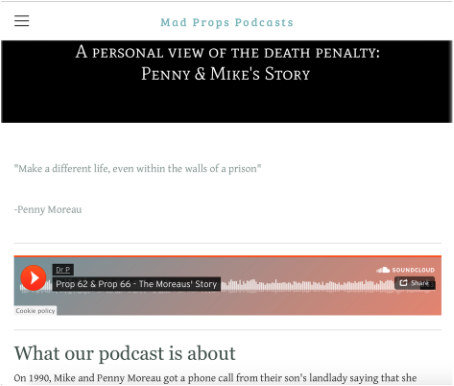 After learning about what the propositions were my partner and I decided we wanted to do the podcast ​on the death penalty. We were assigned in groups of 4 and my group got assigned to Prop 62/66-Death Penalty. After researching the prop we started thinking about what we wanted our podcast to be about. My group wanted to make it about a story because we thought about what we liked listening to. Before creating anything Scott Lewis from the Voice of San Diego came in to talk to our class and mentioned Mike and Penny Moreau. Right away we knew that was the story we wanted our podcast to be about. As our burning question we choose 'what good does the death penalty do' because it had to do with their story. We knew we wanted to interview Mike and Penny, so we reached out to Scott Lewis to get their info and contacted them. We sent them an email, and luckily they were in town that week and they agreed to it! To prepare for this we further researched into the Timothy case/story. We created a document with everything we would need for our interview with the couple. Then wrote questions for the information we needed to get out of the interview for our podcast. We did this by just brainstorming of the document and saving the most important questions. We tried to be sensitive in a lot of the question because we new this would be a hard topic for the couple. Then came the interview, we were set up in a quiet office circled with chairs and a mic in the middle. We were all nervous before because we thought it would be a very emotional interview. So we brought cookies to invite them and tissues. It went really well! We started with a few questions, then Mike and Penny continued the story covering most of our questions. At the end we asked about their perspective about the death penalty and which prop. they will be voting on. We were really happy we had this opportunity because this gave me a new perspective in life to be grateful for everyone. We all enjoyed and are grateful we got to meet and work with Mike and Penny Moreau. After the interview we logged the tape- which is listening to the tape and writing the key points we hear. Then created a script, which we ended not using for our 2nd draft because we wanted our podcast to sound more natural so we went off script at the end. We first had to create a rough draft on a large piece of paper the steps we did throughout the whole project. Our group just generalized it into 3 steps, but in between we did many activities and critiques with podcasts that were already made, we listened for what we wanted or don't want for our podcast. We also heard how people critique podcasts and what others will be thinking of when listening to the "story". My roll wasn't to do this but, I think creating this process board was a really good idea because it quickly informs people of what we did and includes pictures which makes it easier to visualize. Can I just start off by saying... Making a podcast is hard! My group struggled a bit because we recorded 4 times. The 1st recording we did by reading off the script. But later critiqued it and thought it would be a better idea to record it off script to sound more natural and have a better flow. So we recorded a 2nd time with the 4 of us and it ended up accidentally being deleted! The 3rd time we recorded it again but the audio was bad because it sounded fuzzy and you could hear the background. Also when editing it was hard and didn't sound the best because sometimes we would talk overeachother because it was the 4 of us. The 4th and final time was recorded with Jackie and I because we thought it would be a better idea so it can sound a bit cleaner with a less voices and the audio sounded great! Recording was the best part because a lot of the times we messed up, mostly me.. but it was funny. I did a lot of the editing using Audacity and it sure was hard because I had no idea what I was doing in the beginning. I kind of messed around with it finding different ways to do things and observing all the tools. Somedays it took me hours to get all the clips cut. ​I am happy I had this experience because I can say now that I know how to edit and it sounds cool! It was the best feeling listening to the whole podcast when we showcased it at the OnStage Playhouse in Down Town Chula Vista. I felt relief and accomplishment!